This photo shows ultracold lithium atoms being confined by intersecting laser beams. Image: Jeff Fitlow/Rice University. Atomic physicists at Rice University have verified a key prediction from a 55-year-old theory about one-dimensional electronics that is still relevant thanks to Silicon Valley's inexorable quest for miniaturization. Stranger still, because of this collective behavior, TLL theory predicts that a moving electron in 1D will seemingly split in two and travel at different speeds, despite the fact that electrons are fundamental particles that have no constituent parts. This strange breakup, known as spin-charge separation, instead involves two inherent properties of the electron – negative charge and angular momentum, or ‘spin’. In a study in Physical Review Letters, Hulet, University of Geneva theoretical physicist Thierry Giamarchi and their colleagues report taking advantage of another type of fermion – ultracold lithium atoms cooled to within 100 billionths of a degree of absolute zero. The used these ultracold atoms both to verify the predicted speed that charge waves move in 1D and to offer confirmation that 1D charge waves increase their speed in proportion to the strength of the interaction between them. "In a one-dimensional wire, electrons can move to the left or to the right, but they cannot go around other electrons," explained Hulet, a professor of physics. "If you add energy to the system, they move, but because they're fermions and can't share space, that movement, or excitation, causes a kind of chain reaction. In their experiments, Hulet's team used lithium atoms as stand-ins for electrons. The atoms are trapped and slowed with lasers that oppose their motion. The slower they go, the colder the lithium atoms become, until, at temperatures far colder than any in nature, the atoms behave like electrons. 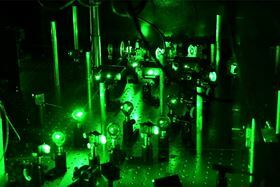 More lasers are used to form optical waveguides, one-dimensional tubes wide enough for just one atom. Despite the effort needed to create these conditions, Hulet said the experiments offer a big advantage. Having the ability to control interactions also sets the stage for testing the next TLL prediction. This is that the speed of charge waves and spin waves diverge with increasing interaction strength, meaning that as electrons are made to repel one another with greater force, charge waves will travel faster and spin waves will travel slower. Now that the team has verified the predicted behavior of charge waves, Hulet said they next plan to measure spin waves to see if they behave as predicted. "The 1D system is a paradigm for strongly correlated electron physics, which plays a key role in many things we'd like to better understand, like high-temperature superconductivity, heavy fermion materials and more," Hulet said.